We are enrolling students for next school year in Kinder and AM/PM TK. Starting February 1st! Enrollment Applications will be available on 2/1in the office. Office Hours: 8am to 4:00pm Monday through Friday. Jefferson Elementary School is a world class Elementary School offering students grades TK through 5th grade an educational experience of a lifetime. 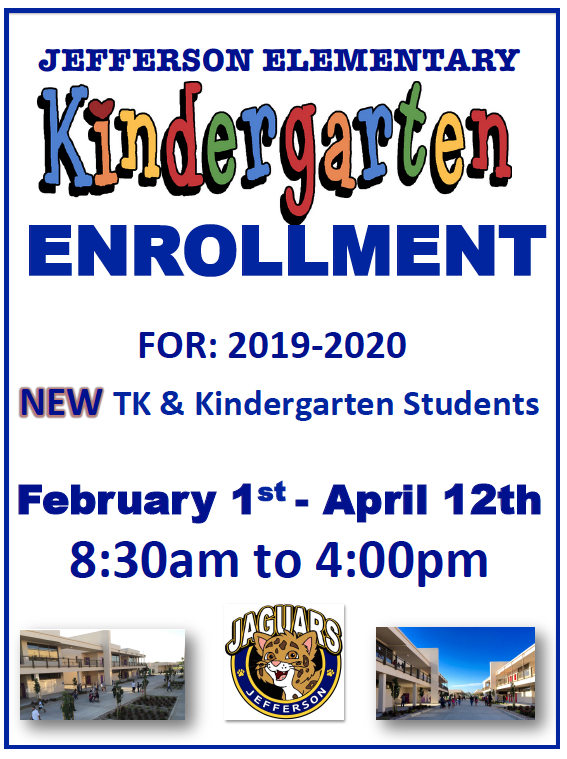 Enrollment for the 2019-2020 is now open for Kindergarten and AM/PM TK students. At Jefferson School, we believe that every child in every classroom can and will achieve success! Programs like AVID, STEAM, School of Dentistry and other are focused on educational experiences that promote PERSEVERANCE to College and Career!